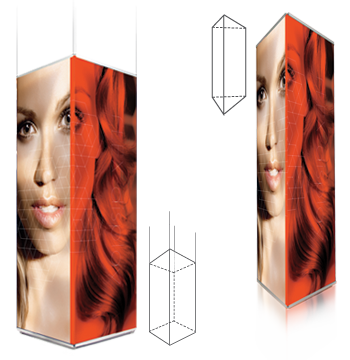 A three-sided display to attract maximum attention. The triangular base is foldable for easy transport, and the telescopic poles make it possible to vary the display height. Horizontal snap-lock bars create an attractive space for your graphics or message. Print size: 3 panels of 85 cm x 130 - 245 cm. Like the triangular display, this square display allows more space for graphics, attracts attention, yet is easy to transport due to the foldable base. For ceiling mounting, no upright poles are required. The banners are mounted using horizontal snap-lock bars. Print size: 4 panels, 85 cm wide.